One way to help improve the performance of Acctivate is to take some of the pressure off of SQL Server queries. This is especially true for companies that have several users and/or are using an Express instance of SQL Server. This article will cover the process of making changes to Business Activity Review settings to help reduce the toll on SQL Server. The easiest change is for users that do not use Business Activity Review. If this is the case, simply un-selecting for this to open automatically when Acctivate opens will resolve the issue for these users. 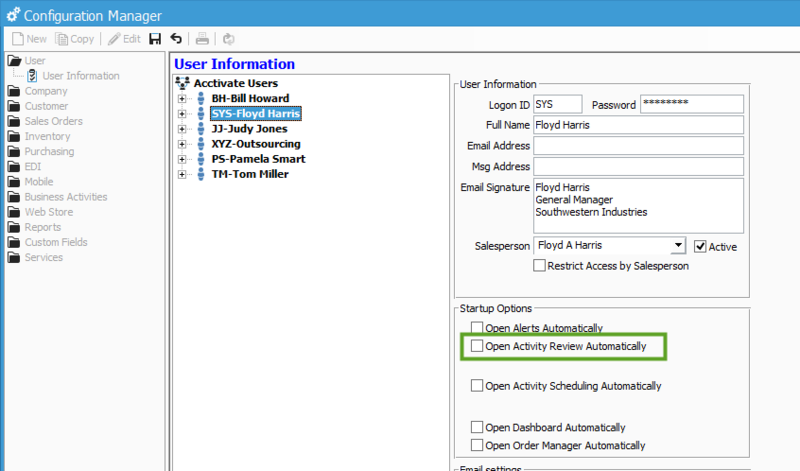 To do this, open File > Configuration Manager > Users and select the user(s) that do not use Business Activity Review. Click Edit and un-check the Open Activity Review Automatically option, then click Save. NOTE; this may also be applicable to the Open Activity Scheduling and Open Dashboard options as well, as both of those options also have an auto-refresh function. The next change that can be made is to remove the auto-refresh, or set it to 15 minutes. It may also be helpful to specify the Assigned To so that it is not showing activities for Anyone, and to exclude unassigned activities and specify a status that excludes completed activities. By changing these settings, the query in SQL is smaller as the data in the query is more refined, and SQL is not needlessly re-running the query every 1 to 5 minutes, taking up resources and slowing performance. Keep in mind, these settings are user specific. This means that these changes would need to be made for every user in Acctivate.